The Renaissance Performing Arts Association’s new performance space, Theatre 166, will kick-off its inaugural MT Business Technologies Black Box Series with The Light in the Piazza on October 5 & 6 at 8:00 PM, and October 7 at 2:30 PM. Directed by Michael Thomas, this Tony awarding-winning show tells the poignant tale of a mother and her developmentally disabled daughter traveling in Florence in the 1950s. A story of love, loss, and letting go, it features one of the most beautiful scores ever written for the Broadway stage. Piazza offers an intricate score – beautiful, haunting and emotional – unlike any other Broadway show ever heard. 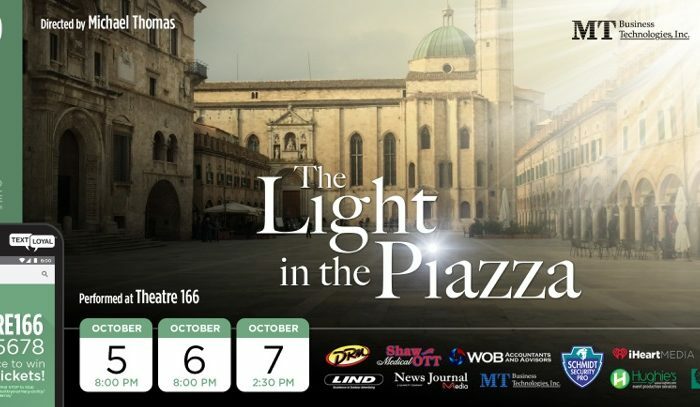 With music and lyrics by Adam Guettel, The Light in the Piazza tells the story of an American woman who is vacationing in Italy with her daughter. When the daughter falls in love with a local Italian boy, Margaret, the mother, struggles with whether she should reveal her daughter’s secret: that she is developmentally disabled and will remain forever childlike. The Light in the Piazza is at once humorous, romantic and heartbreaking. Composer Guettel, who is the grandson of composer Richard Rodgers, won a Tony Award for Best Score in 2006. The complexity of the music, which has been compared to Ravel, Bartok and Stravinsky, and poetic nature of the lyrics combine to create a unique and profound theatrical experience. The Light in the Piazza is an intimate, yet sweeping production. Staged in the Renaissance’s new Theatre 166 black box space, it will appeal not only to lovers of serious classic theatre, but also to anyone craving alternatives to the normal popular offerings. Daring, passionate and deeply dramatic, The Light in the Piazza is unlike anything ever staged at the Renaissance. It is rated PG for very mild language and adult situations. The cast includes Lori Turner as Margaret Johnson, Maddie Baer as Clara, Ryan Shreve as Fabrizio Naccarelli, Sue Amstutz as Franca, Colton Penwell as Giuseppe, Jacob Poiner as the Priest, Elizabeth Stillion as the Tour Guide, Michael Miller as Signor Naccarelli and Pam Phillips as Signora Naccarelli. In addition to the talented cast of local professionals, the creative team includes Nik Demers, Assistant Director, Aaron Nicolas, Lighting Design, Jason Kauffman and Abe Swanger, Scenery, and Sharon Grimes on Piano. Tickets are $20 and are on sale now at the Renaissance Box Office, via phone at (419) 522-2726, and online at MansfieldTickets.com.